I really like cycling. I cycle for sports, to commute to work, to do groceries or just for fun. Of course, in Holland it’s easy to enjoy cycling as cyclists in the Netherlands have their own roads, traffic lights, parking garages and what not. Whether the Dutch love of cycling was there first or whether the creation of cycling infrastructure enhanced the positive attitude towards cycling is a matter of lively discussion. 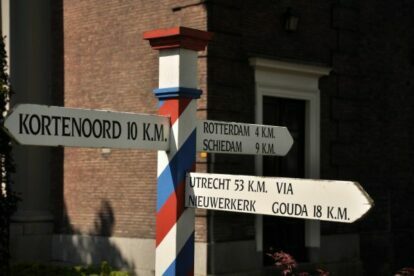 It’s a bit of a chicken and egg question, but whichever was first, the country’s upgrade to facilitate the millions of bicycles had to start somewhere – and it started in Rotterdam 120 years ago, when the ANWB placed the first wooden signpost on the Oude Dijk. Apparently, the population was not very keen on being ‘discovered’ by tourists and the wooden signposts were rapidly used as firewood, forcing a transition to metal. But this replica of the wooden original represents the very first ‘seed’, from which all the magnificent Dutch cycling infrastructure has grown. If you’re a cycling fan, it’s a place of pilgrimage. And if you’re not a cycling buff, just grab your bike and enjoy the detour to Kralingen, the most pleasant of Rotterdam’s neighbourhoods.